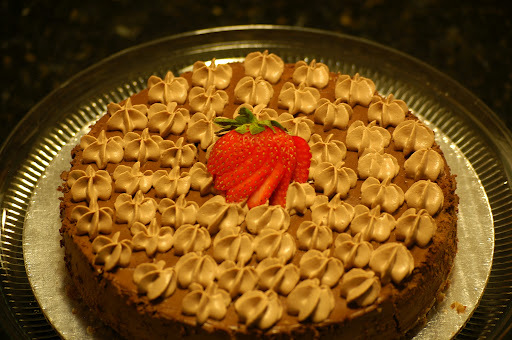 Say Happy Father’s Day with this Delicious Chocolate Cheesecake! Yes, I said SUGAR FREE CHOCOLATE CHEESECAKE!!! My 3 favorite foods, Chocolate, Cheese and Cake!! I knew this would not be an easy task. Making any dessert sugar free isn’t easy but making a dessert where chocolate is the main ingredient doesn’t make it any easier! Unsweetened chocolate leaves a lot for the imagination. It takes the right amount of sweetener, in this case, Kal stevia with lots of vanilla to eliminate any bitterness from the chocolate. I wanted this cheesecake to be chocolaty but if you use too much it will be a “bitter” not so sweet mess. I am not a fan of almond extract but the almond extract in this cheesecake plays a key role of enhancing the chocolate flavor. I think this combo of sour cream, cream cheese and chocolate is perfect. The Whipped Chocolate Cream Cheese Frosting is a must. It really balances out this chocolate masterpiece! You don’t have to be fancy and pipe the frosting on the cheesecake as I did, you can just pour it over the cake. That would be just as pretty and tasty! Best way to melt your chocolate is to cut up 1 oz squares in half at the seam and then split them again. Microwave for about 90 seconds, stirring every 30 seconds. Also, leave out your cream cheese overnight and it will be the perfect softness. As always, I use Kal Brand Stevia so if you use something different, just add a little and taste. Too much of any sugar substitute can leave a bitter taste and we don’t want that. Don’t have a spring form pan? Don’t worry, you can make mini cheesecakes by using a cupcake pan and liners. It will only take about 8-10 minutes to cook. The key to this recipe is tasting your batter before you bake. For your taste, do you prefer a bit more sweeter? Or perhaps a little more almond? Enjoy this chocolaty treat! Prepare Pecan Shortbread Crust in an 8″ spring form pan and set aside. Do not bake. Beat cream cheese and sour cream together using mixer. Add vanilla, Stevia and Eggs. Add melted chocolate and beat until blended. Mix well and taste for sweetness. Adjust if needed to suit your pallet. Add stevia, vanilla, cocoa powder and heavy whipping cream then beat until thick. Pipe or spread onto cooled cheesecake. 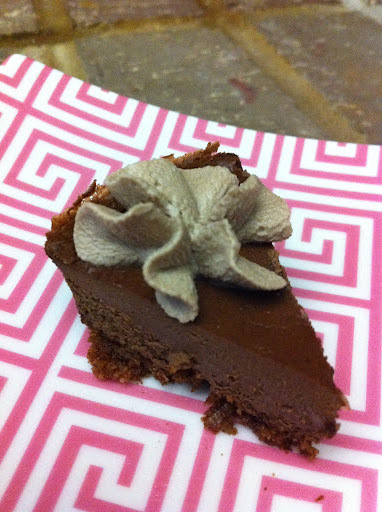 1 slice of Godiva Chocolate Cheesecake: 75 Net Carbs!! I only made the frosting, but it was delicious! @yabba Dabba, glad you enjoyed the frosting!! Is it really a 1/4 CUP of vanilla extract for the cheesecake? I appreciate your prompt response. Thank you for the explanation and options. I should have read your suggestion about the 80% chocolate bar. My family thought that it the cheesecake was too bitter and didn’t really eat it … there is only so much cheesecake I can eat on my own. Next time I’ll try your more recent recipe with the fruit to add natural sweetness. Cathy, it’s fixed. Thanks for notifying me! I know Melissa has warned frequently about just adding a little sweetener and tasting the batter, but I’m going to add some weight to her warning. I made this recipe after having much success with her regular cheesecake recipe. In the regular recipe, I started with a little stevia (I use Stevita liquid) and worked my way up to the 1/4 tsp plus 1/8 tsp – the amount the recipe called for. I thought I’d be safe starting with 1 tsp for this recipe, then adding more if necessary. However, the 1 tsp was WAY too much for my taste. I ended up throwing the entire cheesecake (minus the one test piece that neither my five year old son nor I wanted to finish) in the garbage. Lesson learned! I now know when switching to a different recipe, start with a very small amount of stevia and add more if needed. Thanks again, Melissa, for the great recipes!!! Sarah, yes, every recipe is SO different! The unsweetened chocolate adds another bitter component so that is another “bitterness” that is working against us. You can always add more but you can’t take away. I hate that you had to throw away an entire cheesecake! : ( If you had tasted it before you baked it (and it was bitter), you could have always added more cream cheese. (Just for future reference). Everyone’s pallets are SO different when it comes to stevia and sweetness. Anne, of course every oven is a little different but this cheesecake doesn’t need to cook as long because it contains actual chocolate and from my experience, sets up much faster. Feel free to bake it longer. Hope this helps. Natali, oven times vary so cook it longer until the center is set. I hope you enjoy! Do you have the other nutrition components? Calories, fat, protein etc? Julia, I did not list on my older recipes. There are plenty of sites and apps that you can simply enter the ingredients in and find out. If it wouldn’t take 1 million years to do 200 recipes, I would do it for you.